Helloooooo, how's things with you? 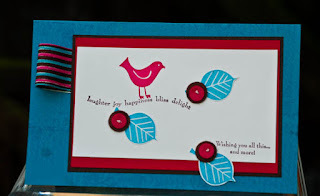 Thank you so much for all your lovely comments during our blog hop did you enjoy it? What fabulous projects along the way, tons of inspiration and of course a good glimpse of the new catalogue that's going live tomorrow!!!!!! Guess what? Is Susan's Happy Birthday today. Susan doesn't have a blog so cannot link, but I wish she had as she is an extremely talented crafter, her work is simply gorgeous. She is also a kind and very funny person and she often keeps us entertained at our team training days with funny jokes. Susan's favourite colour is Teal and this is the card I made for her special day. I paired Taken with Teal with Rose Red and Chocolate Chip and I have used the ever so lovely Best Wishes and More set. I reckon out of all of the catalogue this set is the most overlooked (well it was by myself that's for sure) and I just love it now. Very versatile with lovely sentiments. I have also added a few felt pieces from the NEW sweet pea felt pack. The Choc Chip striped ribbon has been coloured with markers ( I explained it a bit better in this post) and looped under the layers.